“It started with my attraction to the abstract letters and the crazy colors I would see from the subway train in Portland,” Alto says. He began by just doodling on his notebook pages in middle school. But drawing animals or faces did not interest Alto. A trip to Brooklyn, New York inspired him further, where he happened to run into a graffiti artist he’d read about in books. “These people were legends to me, and when I actually got to meet them, it was really humanizing and that made me feel like I could do it too,” Alto says. During high school he joined a group that created a multi-panel graffiti art installation at a firehouse in North Portland honoring victims of the Virginia Tech shooting. And eventually his personal art moved from notebook pages to canvas. Alto’s interest in programming did not begin until after he started college at University of Oregon. He entered as a business major but found that computers held more of a fascination for him. 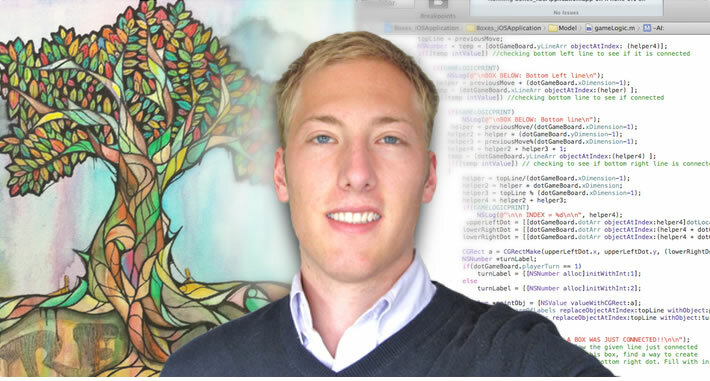 Nick Alto's BoxDot app was a project that incorporated his passions for art and coding. “When I first realized that all the games that I grew up playing and the applications that I used on a day-to-day basis stem from just ones and zeros — that just really blew my mind,” he says. His sophomore year he decided to transfer to Oregon State and switched to a major in computer science with a minor in business. Although computers are his primary focus, his art still plays an important role. “It helps me maintain a balance of both sides of my brain, but also it gives me insight into software usability,” Alto says. While studying abroad in Spain, he was inspired take on a project that blended both his passions and added in his interest in entrepreneurship — developing a mobile app. To start he chose a simple paper and pencil game that he and his sister played as kids on car rides. Although he had extensive experience with Apple hardware and software he soon realized it was not an easy project, so he spent about a year learning the fundamentals of app development in his spare time. The result is an elegant looking iOS application called BoxDot. The game starts with a grid of dots and each player takes a turn drawing one line between any two dots. Whoever closes a box gets to write their initial in the completed box and wins one point. It turned out to be more than a fun side project. Alto says it helped him secure a job with OSU’s Ecampus department as an iOS developer and also brought offers for contract work. “I was blown away by the initial reaction to BoxDot. I had hoped for maybe 50 downloads or so, but as of today I have more than 5,000 downloads,” Alto says. Although his artistic bent is making its way into his computer programming he still likes to keep it as a separate activity. “I mainly do art to relax. It’s nice that I don't have to do it as a living because I think the freedom is what I like most,” Alto says.